Handmade quilts, lap quilts throws and baby crib quilts make lovely personalized gifts and personalized home decor for a variety of occasions. They can also make an occasion special! You can add embroidered names, dates and special wishes with custom embroidery to make monogrammed and personalized gifts out of quilts, such as Country Double Wedding Ring Quilts (photo). As you browse Bluebird Gardens, items will include examples of the variety of ways you can personalize quilts, baby quilts, lap quilt throws and pillows by adding embroidered names and dates. Bluebird Gardens Online Form Guides You! When you place your online order, you can designate how you want your item personalized with custom embroidery; desired thread color, font or lettering type, size of the letters, and where on the item you want the personalization placed. Our prices range from .25 cents for 1/4 inch letters to $4.75 for 4 3/4 inch lettering plus a $10 set up charge for all custom embroidery orders. If your order requires either larger or smaller lettering, or any other special detail, there will be a box you can check and type in special instructions. 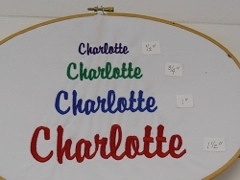 We offer 13 fonts, or lettering types, for your custom embroidery personalization. Select a font that helps to reflect the message you want on the quilt. Names of the fonts (photo) illustrate how the custom embroidered fonts will look on your custom gifts. The most requested font style is Zapf Chancery followed by Diane Script. For personalized lap quilt throws, quilted wall hangings and throw pillows as wedding and anniversary gifts, the most popular customer request is to have each of the couple's first names and wedding date embroidered somewhere on the items. For handmade quilts, the most popular location is in the right hand corner or at the bottom center. On personalized throws, quilt wall hangings and baby quilts, the most popular location is in the center or bottom center. Another popular choice for personalized quilts is to add the last name to the bride and groom's first names as well as wedding or anniversary date. For personalized crib and baby quilts, the most popular customer request is to have the baby's full name and birth date embroidered at the bottom. The second most popular request is to add birth place location. We have also been asked to add birth weight and height and a special dedication including the name of the baby quilt givers. Handmade quilts and lap quilt throws make great handmade gifts also work well as unique home decor, either tossed across furniture or displayed on walls. Some of the lap quilt throws make interesting quilt wall hangings and have been personalized to include a special name or event date into the overall design. We have also added poems and favorite sayings to mark special occasions. For personalized home decor with lap quilt throws, we have written family names in the middle of applique pieces like leaves, hearts and animals; added family names, dates and favorite sayings along borders, along the top and bottom, and at corners. We have also added ribbons to make prayer quilts. For holiday throws, we have been asked to appliqued "gift tags" with "To" and "From" at the bottom and added family names in gift boxes or other special places on the throw. Another quick and easy way to personalize a quilt is to add custom embroidery to custom quilts and already made bed quilts. Add embroidered blocks with monogrammed and cursive names, logos and sayings to quickly make a quilt special. You can also design a custom quilt by adding embroidery of special characters such as favorite Disney characters, hobbies, animals or musical instruments. All Bluebird Gardens text, photos, custom products and site design are the sole property of Bluebird Gardens LLC. Copyright 1999-2017.